Thermal imaging helps us to discover water intrusion, cold or hot air infiltration, insulation inadequacies and electrical hazards. High definition (or high resolution) thermal imaging refers to the fine detail and clarity of a thermal image. This means it contains a large number of pixels per unit of area. In this case, a thermal imaging camera taking a high definition photo means you will find smaller problems at greater distances. You can find significant problems that could be missed with a lower resolution thermal imaging camera. More pixels mean greater temperature measurement accuracy, particularly for small objects. To the professional thermographer, a high definition thermal imager means a strong competitive advantage. Our new high definition thermal imager saves us plenty of capture and reporting time. Moisture in building materials can destroy structural integrity and nurture mold. The first step in moisture problem remediation is to quickly and accurately locate and remove all sources of moisture. 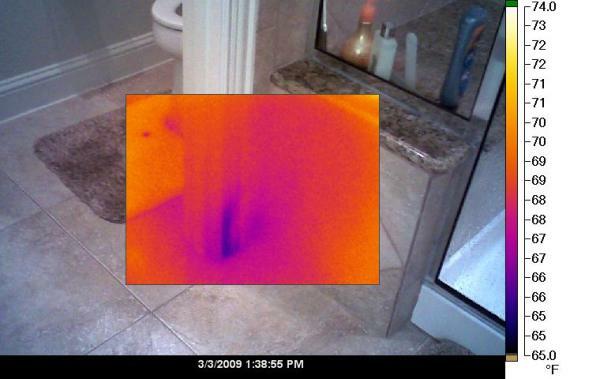 Infrared cameras instantly show you what's wet and what's dry. IR cameras can instantly find the ultimate source with little or no physical disassembly of the premises and minimal disturbance of inhabitants. Infrared cameras are the inspection assets preferred by building experts for fast, reliable, accurate building diagnosis in the entire range of building problems. The astronomer, Sir William Herschel, in Bath, England, discovered the existence of infrared radiation by trying to measure the heat of the separate colors of the rainbow spectrum cast on a table in a darkened room. He found the highest temperature to fall beyond the red end, which he reported to the Royal Society as Dark Heat in 1800. His son, Sir John Herschel, who was more interested in photography, managed to record the heating rays on the infra red side of red by creating an evaporograph image using carbon suspension in alcohol. He termed this image a thermogram. The foundation was laid for the advances that would come over a century later with the sophisticated thermal imaging devices that are used in military, industrial and medical applications. ​Using thermal imaging, heat losses, humidity and air leaks in buildings become instantly visible, providing clear evidence of construction faults. a. Air leakage pathways present within a completed construction can be identified and rectified prior to subjecting the building to air permeability tests, reducing the risk of repeat testing being required. b. Depending upon the nature of the construction, even a building that meets or exceeds the building regulations may still be at risk of premature deterioration due to air leakage and subsequent condensation, therefore identifying where air leakage is occurring can be critical. ​c. Air leakage pathways can often indicate rainwater ingress pathways further adding to the potential benefits of an infrared survey. ​Thermography is commonly used to identify air change rates with the help of the so-called ‘blower-door’ process, which creates under-pressure in buildings. Because the air pressure outside is higher than the pressure inside, the air will try to enter through unsealed areas. Using an infrared camera, this airflow can easily be seen, clearly revealing any unsealed areas, which can then be attended to before coverings and fittings make correcting this potential fault both expensive and time-consuming. Water tends to retain heat longer than roofing material and leaks can easily be detected using thermography at night, when the rest of the roof has cooled down. This ability to determine the exact location of a leak in a flat roof system makes it feasible to repair the faulty areas, rather than the entire roof, saving both time and money. Infrared thermography provides valuable information during the renovation of buildings and monuments. Framework constructions, hidden behind mineral plaster, become clearly visible in the infrared image and decisions can then be made as to whether exposure of these structures is necessary. Thermography can also detect the detachment of plaster from walls at a very early stage, enabling preservation measures to be taken. Crevices, leaking joints and loosening stones in chimneys and exhaust sections of heating systems can clearly be seen using infrared thermography. Overheating areas, which can lead to chimney fires, are immediately visible on the infrared image. Fire hazards, caused by building too close to hot heating and exhaust areas, can also be recognized at once. Structural damage, health problems and allergies develop in living and working spaces where moisture and mildew are present. Fungus spores grow in areas where humidity from the ambient air forms droplets and falls, and mineral substances from walls, wallpaper and paint are excellent breeding grounds. Infrared cameras, with special software functions for dew point visualization, can identify potentially hazardous areas automatically, via a color alarm in the image. Infrared cameras are popular for finding moisture intrusion problems because of the many advantages they provide over conventional methods. Using an IR camera in conjunction with a moisture meter allows problem areas to be located quickly and documented easily.